Eight years ago, eight days after Christmas she arrived. She was over due and I was huge. Huge, I tell you. January first came and went and still no baby. But before the end of January second we finally welcomed our first baby into the world. The best gift in the world, my new baby, me - becoming a mom, our family growing. It's hard to believe that it all began eight years ago. My, how time flies. 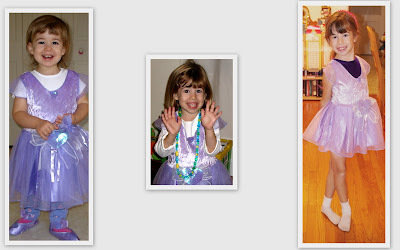 As you can see from the following pictures, she loves to dress up still...and in the same purple dress she got when she was just two years old. Now it's more like a tutu. When I told her to strike a pose for the newest picture in that dress she posed very much like a favorite Degas sculpture of mine. Eight is great! 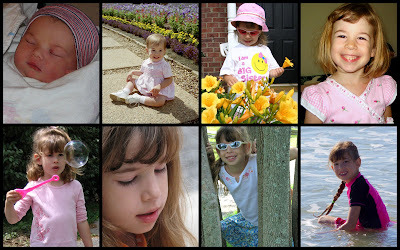 ;-) Happy bday - it's amazing how time flies by!